The cork of this 20 year old went out as if it was a 2-year-old and didn’t smell bad, which already made me happy, since I got this bottle on Ebay, and you never can be sure of how it was stored… maybe 20 years under the radiator, or in the fridge, or some other inappropriate place. Well this one was perfect! It had a nice red colour with a slight orange rim and was rather unclear, which I don’t mind really. The bouquet was very nice, of red fruit with a little stony, chalky touch I really liked. 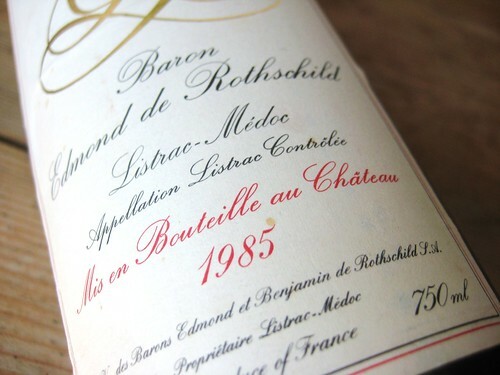 On the palate it had a silky feel, with tannins like soft little atoms which gave the wine an elegant structure. Here again it had red fruit with a nice mineral edge and a touch of cigar box. On the back-end it was a little astringent, which might indicate that it could stay some more years in the cellar, but my feeling is that it won’t get any more better. It is just right now: an elegant wine and a nice surprise I wouldn’t have expected from a pick on Ebay. If I had to give a grade it would be 88-89.